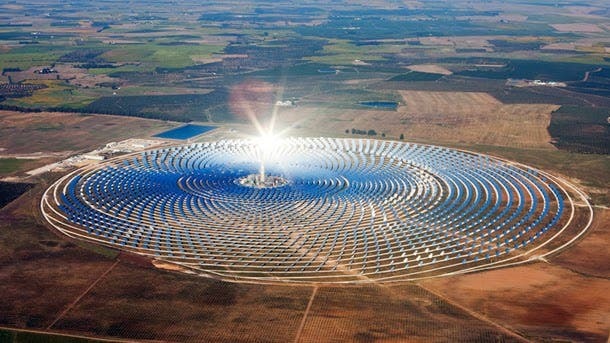 Morocco is poised to become a solar superpower, as they revealed plans for the largest concentrated solar power plant, powered by the Saharan sun. The plant will go online by 2020. The good thing when you have vast portions of desert is that you can use them to generate solar power, without actually losing useful land. The Noor Solar Project, being built just outside the Saharan city of Ouarzazate, will power about half of the country’s energy, while also incorporating hydro and wind energy systems. But what makes it really special is that this array will be able to generate energy even after the Sun has gone down. Noor will be a concentrated solar plant; it has a huge system of mirrors which will reflect sunlight and heat to a small area, allowing the Sun’s energy to heat up a solution that can be heated with water at a later time, without losing much energy. This is quite significant, because it deals with the problem of availability – photovoltaics only offer energy when the sun is shining. This particular solution is a synthetic thermal oil blend that will be heated to 393 degrees Celsius by the concentrated sunlight. After it is properly heated, it will move on to a heat tank containing molten sands that can store it for three hours with minimal energy loss – and small losses afterwards. Ironically, this laudable project emerged from a lack of resources. Because unlike other African countries, Morocco doesn’t have significant oil reserves, they were forced to find other alternatives – and renewable energy was the solution. If only other countries could learn from this… It’s about time all that desert land was put to good use.